As one of Guernsey’s leading law firms, our new client, Babbé LLP, has an enviable reputation for excellence in legal services. So when designing and developing their new website, we had to consider whether or not to keep their existing corporate identity. They wanted a fresher more contemporary look but as there was considerable equity in their brand, we felt a full rebrand would have been a costly and unnecessary exercise and opted instead to evolve their current identity to better reflect their positioning and reputation. Our starting point was the acute accent, unique to Babbé amongst its competitors. The accent was ‘sharpened’ to make it more defined and then used to form a matrix of intersecting geometric shapes, creating a bold visual element which is distinct, contemporary and flexible enough for use across all of Babbé’s new marketing materials, while maintaining a visual connection to the brand’s existing heritage. The strapline ‘Accent on Excellence’ is incorporated to further reflect the Babbé ethos. Our first application was in the new website we designed and developed. 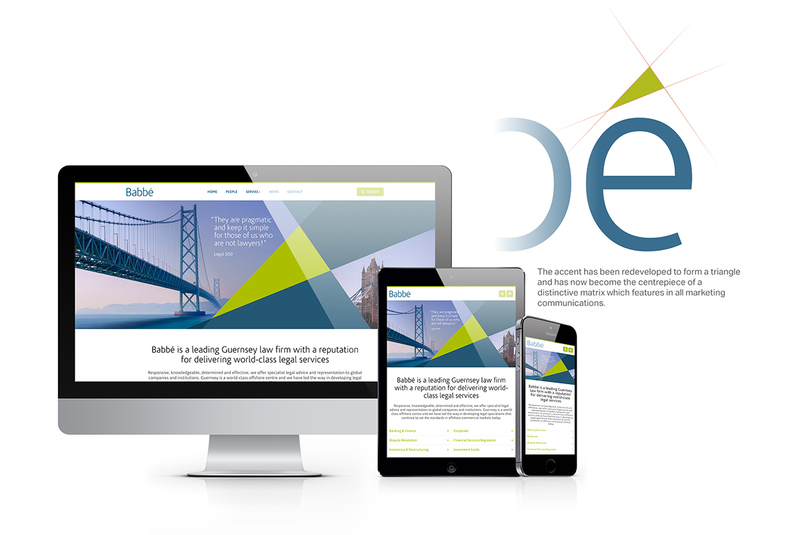 From the initial brief, we worked closely with the client to create a site that provides a modern and more vibrant image and a better showcase for Babbé’s range of services and expertise. The new site has been developed on a secure and easily managed CMS, is fully responsive and offers a much improved, more intuitive, user experience.